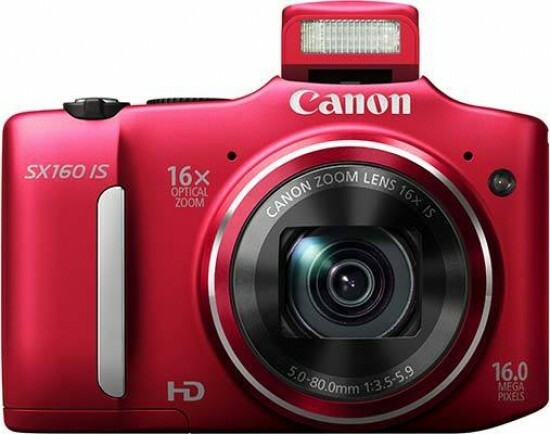 If you're used to pocket-sized cameras that you can slip away when not in use then the Canon PowerShot SX160 IS is going to be a big surprise to you. It has to be held all the time, hung around your neck or put in a bag. To that end, the SX160 is uncomfortable but if you're ok with that then it's not. The grip is big enough to hold the camera steadily with one hand without being obtrusive. The batteries we received for the test were unopened when we started but they ran out halfway through the test. On a day of testing, we use a camera more than what an average day of use would be so we expect premature battery dumping, but we were surprised when they ran out quite this quickly. Therein lies the problem with AA batteries in digital cameras and it's likely that this could start up a debate about the uses of AA batteries. So here it is: they're more readily available in a shop on holiday or in a remote village when out hiking etc. We would still advise to get a pack of four Eneloops or similar. We wonder whether the designers - knowing that the lens had to be stuck out quite so much to incorporate the zoom - designed the rest of the Canon PowerShot SX160 IS to look like a prosumer/compact system camera. It works nicely by squatting the flash over the lens to look like a viewfinder and even putting the flash pop-up button on the back to look like an optical viewfinder from a distance. Given the Canon PowerShot SX160 IS's low cost, the corners have to be cut somewhere and we think it's in the build quality. The camera doesn't feel as solid as it could although there are some nuggets in there such as the lockable battery door and better port cover. The buttons feel firm and the dials aren't too slack or flimsy. Image quality is great on the SX160. We really enjoyed using it and - naturally - got some excellent photographs with it. Pictures are sharp, colourful and (at low ISO) noise free. The 1cm macro mode is great although the image drop-off isn't so hot. The Canon PowerShot SX160 is a low cost, big zoom point and shooter that will have an option or mode for pretty much anything that a photographer can throw at it. We say photographer because with the manual controls, that's exactly what you become. If you've ever thought about getting into photography but don't have the money or are unsure if you'll enjoy it, a camera like this is perfect because it offers the possibility to advance your knowledge without a massive outlay. If you do become passionate about it, welcome to the club.